"God bless Liz and the person that she was and that we will..."
"God Bless our Aunt Betty. 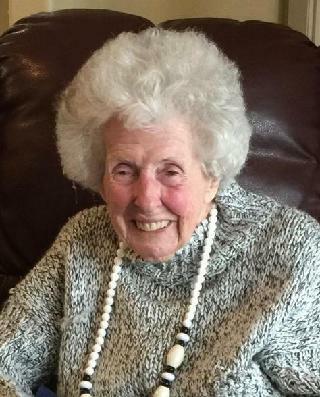 She is an inspiration to all the..."
Elizabeth T. Light Spalding, 93, passed away peacefully on March 8, at Liberty Heights, Colorado Springs, CO.
Born in Saco, Maine, Liz treasured her New England and Irish heritage. She had a wonderful way with people using her Irish charm and wit. She had a gift for sales and was very successful selling insurance in New Orleans and real estate in the Washington, DC area. Liz was most proud of her career at the Revlon Company during the 1950's, 60's and early 1970's. She was an excellent mentor, training new sales representatives. She received many awards as recognition for her success. She was proud of making her mark as one of the few women in a primarily male dominated profession. Liz met and married Maj. General J. Robert (Bert) Spalding when he was stationed at the Pentagon. Their assignments included Peterson Field in Colorado Springs, and Warner Robbins AFB, Georgia. Liz held military service in high regard. She fondly remembered meeting and welcoming President and Mrs. Jimmy Carter as they returned to Warner Robbins AFB, on one trip home to Plains, GA from Washington DC. Upon retirement, Liz and Bert settled in Monument, Colorado. Liz is survived by her son, Bruce Light (Nancy) of Elbridge, NY. She was preceded in death by her parents, William and Jemima Smith; brothers Robert, Thomas, and James; sister Kitty; and her husband Bert. The family is grateful to the staff of Liberty Heights, Right at Home, Penrose St. Francis Medical Center and Abode Hospice for all the care and compassion shown to Liz. A memorial service will be held on Wednesday, May 29, 2019, 2PM at the Shrine of Remembrance, 1730 E. Fountain Blvd., Colorado Springs. Inurnment will follow at the Shrine of Remembrance Mausoleum, Liberty Columbarium. Memorial contributions in Elizabeth's name may be made to Francis House, 108 Michaels Ave., Syracuse, NY 13208.